At this time of the year, as the garden begins to get ready for its winter sleep, it becomes more difficult to find six interesting items to present for Six on Saturday. This week I’ve selected a clutch of plants with a pink, or nearly pink hue, which have flowers still persisting despite the cooling overnight temperatures. The days are still warm, but we had 4.9 degrees one recent morning and that provided a small taste of what’s ahead of us. Number one, above, is some kind of chrysanthemum which is quite low growing: not much more than a ground cover. I’ve no idea of its name, but it obediently puts on a show of cheerful flowers at this time every year after enduring, uncomplainingly, a complete lack of attention most of the time. A perfect plant for our conditions. Two: Loropetalum chinense ‘Plum Gorgeous’. This shrub struggles in my garden, and probably wasn’t a good choice, but I rescued from the ailing plants’ table at the nursery a couple of years ago. Good rain a few weeks ago has ensured a prolific flowering, and it’s happier now the weather isn’t so hot. Three: Sedum, complete with visiting bee. I don’t know which Sedum this is, but its flowers, the size of my little finger nail, are a magnet for insects. 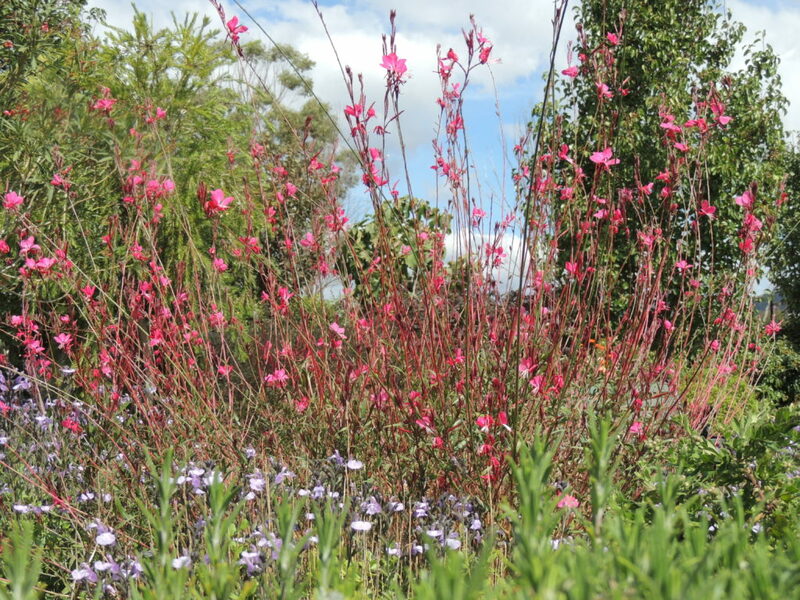 Four: Gaura lindeheimeri ‘Belleza Dark Pink’ has flowered for months, and how I love to see her tall stalks topped with dark pink flowers dancing in the morning sun. I’ll make cuttings of this plant to dot elsewhere in the garden. She’s very well-behaved and doesn’t try to take over. 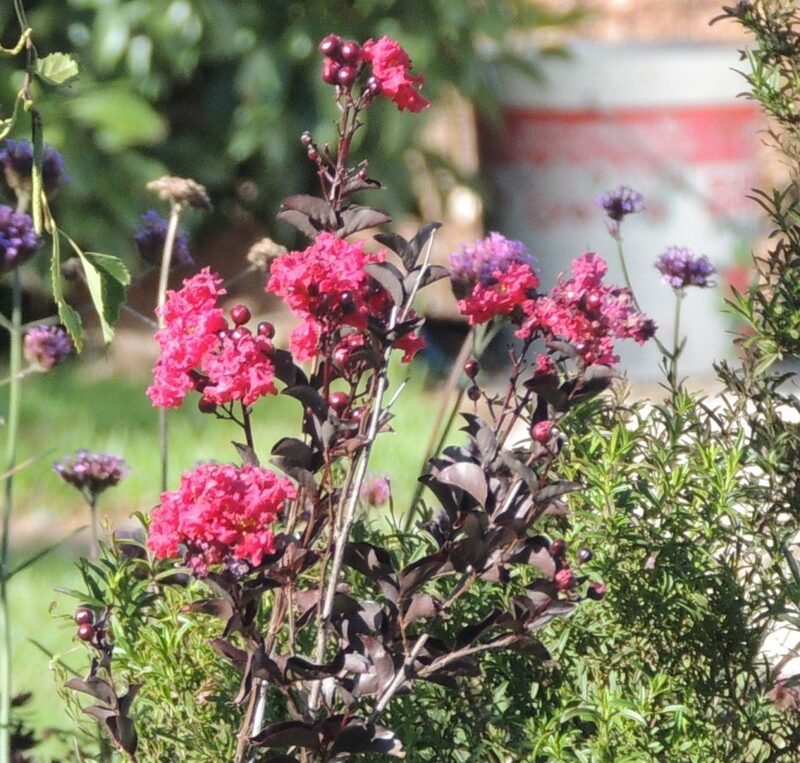 Five: The flowers of Lagerstroemia indica ‘Diamonds in the Dark’, planted last Spring. It really hasn’t done much, and in fact has been dug up and placed in a very large pot, in the hope that it will be inclined to put on a lot more growth later this year. The soil here is largely clay, and I thought perhaps that was a factor governing the lack of growth. It certainly cheered up after its move and put out these flowers which contrast nicely with the dark leaves. 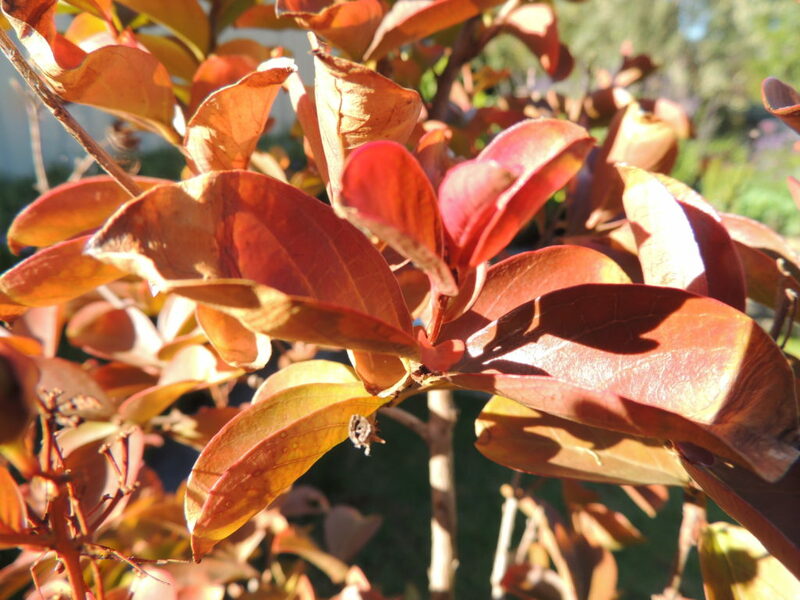 Six: Lagerstroemia again, this time ‘Tonto’ which is already clothing itself in Autumn colours. Six on Saturday is a community of gardeners from many different countries, all with interesting gardens and ideas to share. To see other gardens, pop over to the blog of our host, The Propagator and follow the links. Weather today: partly cloudy, 7 – 25 degrees C. Happy gardening everyone. I look forward to seeing the Gaura each year. The white(ish) one goes on and on all through the summer. That Plum gorgeous is a new one to me. It looks healthy now. PS. “Ish” has become a useful addition to our vocabulary. I do some Maths tutoring locally and one of my tutees when asked whether he understands a particular topic frequently answers “ish”! I think that is a reasonable comment and I know exactly what he means. …… I have to try a different explanation. Gauras are such good plants in every way, I think, and the newer cultivars don’t throw themselves around the garden like the old ones do. I love the idea of ‘ish’ becoming a new word. Another bit of ‘shortspeak’ covering a whole gamut of feelings. I do like pink flowers. The Gaura lindeheimeri ‘Belleza Dark Pink’ is lovely and graceful. Not seen it before. It’s worth investing in one if you do see it. It’s a trouble- free plant and also grows well from cuttings. Beautiful Jane! You know I love pink flowers. You still have a lot of color left for autumn and they are lovely. I thought of you as I was writing the post, Cindy! I tend not to like pale pinks, but these are all richly colored and very beautiful, particularly “Diamonds in the Dark.’. Some weeks you show us plants that are completely alien and exotic to me, but this week they are all plants that I might see in gardens around here. It is so interesting seeing how plants from all around the world mix in gardens all around the world. Seeing how plants grow around the world is just one of the good things about SoS, I think. ‘Diamonds’ has been a bit disappointing so far and I’m longing for it to grow up and put on a dazzling display as its name suggests it should! The colour is gorgeous. Gaura is a lovely plant, definitely one for my wish list! Yes, do get one if you can, I’m sure you won’t be disappointed. All so pretty in pink! I love ‘Diamonds in the Dark’ and ‘Plum Gorgeous’, two real beauties, and what a fabulous chrysanthemum, too. Lovely to have a flourish as your season changes. I was so pleased to see ‘Plum Gorgeous’ flower so well and now I’m hoping it will feel more inclined to do so next season as well as I think it’s finally got its roots down. Fingers crossed! That’s a disappointing amount of growth, Fred. I won’t hold my breath with mine then. In fact Lagerstroemias usually do rather well in our area and there are some very big ones to be found: I hope I don’t have to wait forever! That’s a lovely collection, Jane. I was surprised to read that your Gaura is well-behaved as my white form is a rampant self-seeder but perhaps the pink form doesn’t follow suit? I’ve been tempted to try growing Loropetalum again – the memory of killing 3 of them has almost faded. So far the Gaura has behaved impeccably, Kris, in fact I wouldn’t mind if a few little plants appeared. I also have G. lindheimeri ‘Belleza’ which is a compact non- invasive variety and well worth seeking out. A lovely six! I think chrysanthemums are underrated – such colorful, reliable, good-natured plants! Your garden looks to be entering the colder seasons quite gracefully! Must get a Gaura for the new garden: yours is a lovely reminder! I’ve often seen gaura in gardens, loved it but not known what it is. I must keep an eye out for a plant or two to add to my rose garden border. Your pink collection is lovely, Jane. Thank you, Carol. There is a common Gaura that tends to be thuggish, but the newer varieties must have had that behaviour bred out of them. I think they would be airy enough to complement a rose border beautifully. Sounds like perfect weather to me, Jane. 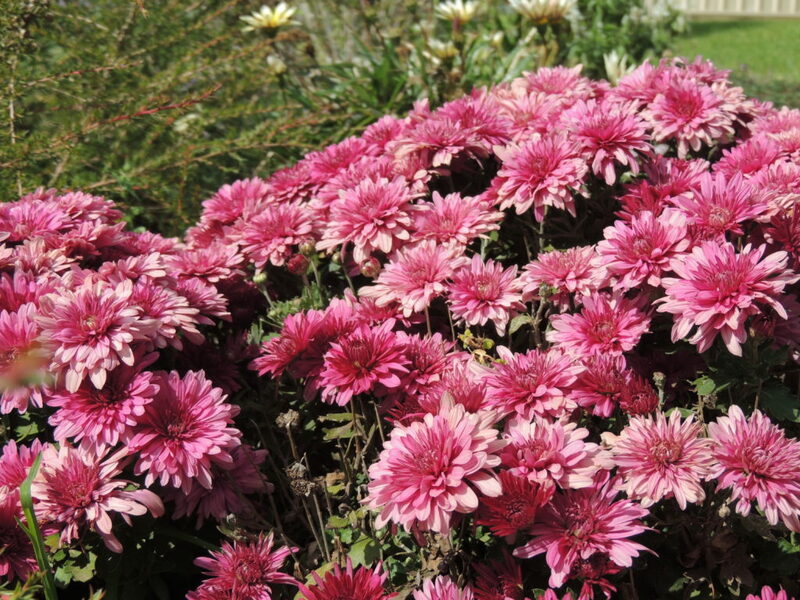 The shade of pink of the Chrysanthemum is particularly appealing to me. It’s a soft shade that way outshines the bright pinks that most garden lovers are drawn to. Sure is getting cold at night though. Luckily we’ve only had the one cold night so far- not enough to use heating yet. In reality the chrysanthemum is more magenta than pink, hence ‘ish’ in the title of my post, but I agree, it’s a pretty colour. Love that chrysanthemum – they are much underused flowers I think with Dahlias grabbing all the attention. I too have a pink Gaura and it flowers for ages. I would like a white one too as the flowers remind me of butterflies. Your lowest temperature about matches our highest at the moment! I agree with you about Chrysanthemums,Jude, and they’re probably a better option for me than dahlias, although I’ve managed to grow a couple of those as well. I haven’t managed to get them to carry over to the next season very well, though. I lifted the tubers, but only one reappeared the next year. It has buds appearing now. We have a whole week of 26 degree maximums ahead of us…sure is a warm autumn. Our garden is at rest and well deserved after the heat and lack of water. I love the pink flowers and just bought some cyclamen which can now happily live outside. We keep one inside during the day and put is outside during the night. I love cyclamens, Gerard. I would like to have some hardy ones for outside if I could find a suitable spot for them…. Thank you Sophie. Sedums are such easy care plants, aren’t they? Just wish I could stop them flopping over! 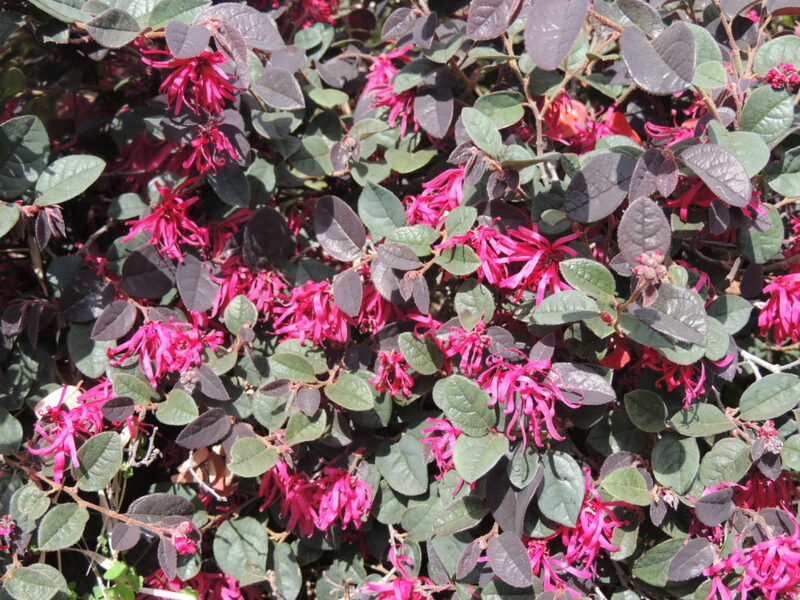 Your loropetalum is heaving w/blooms! Hope it keeps itself going. Nearly a week has gone by Lora, and it’s still looking good. Hopefully it will cope better with the heat now that it has become established. You must be in the southern hemisphere…..what a very lovely chrysanthemum. Yes, I’m in New South Wales, Australia, Noelle. What a shame you can’t grow them Derrick. That’s a bit of a surprise to me as I thought anything would grow in your beautiful garden. 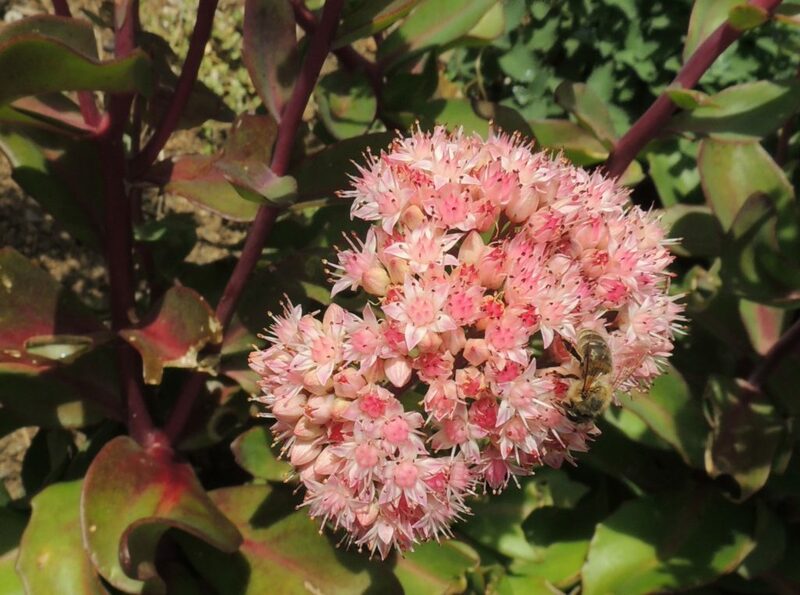 My sedums are coming late this year but as you say magnet for bees. They sure are. Covered with bees in our sunny autumn weather! Your pinks are very cheery, Jane. We have very similar plants. We dispensed with the white gaura due to its weediness. But we have the pink one in a pot (we didn’t trust it not to spread initially). The pink flowers look beautiful in a vase. You’ve had more luck with the Loropetalum chinense than us. Ours gave up the ghost. Hasn’t the weather been just fabulous lately? Fabulous weather, Tracy. A week of warmth ahead of us, but I wouldn’t mind a bit of the wet stuff! There is a small Gaura ‘Belleza’ that I believe has had excessive self- seeding bred out of it. Maybe you could look for one: it’s very pretty in my garden and so far has behaved itself. What a magnificent gaura, I love it. I bought a Loropetalum and it has been sulking for weeks and now I think it is determined to die. I wonder why they are so temperamental . Thank you, Chloris. I love the Gaura. I am surprised that your Loropetalum is unhappy in your climate. I think it’s the summer heat that nearly did for mine. I’ve seen them growing magnificently on the coast in Australia where the climate isn’t so hot and dry. Also a fan of your gaura, it looks lovely. I have one but looks like it didn’t survive the winter, or perhaps it didn’t survive my rough handling on being moved. Or a piquant blend of the two! Fortunately I have a few cuttings from last year which are growing quite nicely. One of the things I like about this plant is that it grows so easily from cuttings. Perhaps the snow did for yours? Mine doesn’t seem to mind frost in the slightest. Lorapetalum is a thing I’ve seen widely in garden centres and as far as I remember, never in a UK garden. I’d regard it as border line cold hardy (even in Cornwall) but it may be more complicated than that. I gather it’s your heat it struggles with. The purple leaved, pink flowered forms are gorgeous. They grow very well on the coast where the temps are not quite so extreme, Jim. I think you are absolutely correct about the heat, and possibly lack of rain was a feature too. I didn’t realise that it would be such a touchy plant when I bought it!